Opposition leaders immediately rejected the Conservative government's budget Tuesday, setting the stage for a possible spring election. Within minutes of Finance Minister Jim Flaherty tabling his "low-tax plan for jobs and growth" in the House of Commons, Liberal Leader Michael Ignatieff, Bloc Québécois Leader Gilles Duceppe and NDP Jack Layton all said the budget didn't contain enough to warrant their support. "We find that the priorities of this government are not the priorities of ordinary Canadians," Ignatieff said. The Liberal leader, who has been demanding a cancellation of corporate tax cuts and didn't get it, cited the lack of support in the budget for affordable housing and child care as other reasons why his party will not vote in favour of the budget. "This is a government that doesn't seem to be listening to what Canadian families are telling us," he said. "We're forced to reject this budget." Duceppe's rejection of the budget is based on the budget's silence on his demand for a $2.2-billion deal to compensate Quebec for HST harmonization. Tuesday's budget contained a number of measures related to NDP demands, including the renewal of the ecoENERGY Retrofit program and financial support for seniors, but they didn't go far enough, Layton said. The NDP leader said nothing in the budget persuaded him that Prime Minister Stephen Harper is willing to "change his ways" and work with the other parties to introduce measures Layton said would help Canadian families and seniors living in poverty. "Mr. Harper had an opportunity to address the needs of hard-working, middle class Canadians and families, and he missed that opportunity. He just doesn't get it," said Layton. "New Democrats will not support the budget as presented." With that declaration, the NDP leader increased the odds of Harper's minority government facing defeat over the budget. 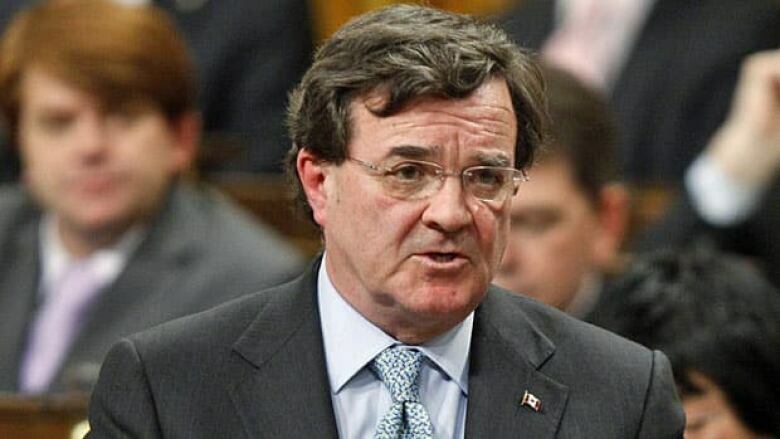 Flaherty blasted the opposition parties for rejecting the budget, accusing them of not actually reading it. During an interview with the CBC's Evan Solomon, the finance minister said there is "no chance" of the government agreeing to amendments on the budget. "The job of the government is not to appease the opposition parties," Flaherty said earlier in the day before delivering his budget speech. During a press conference in the media lockup for the budget, the finance minister said strong fiscal management is the cornerstone of Budget 2011. Now that a $60-billion stimulus plan to get through the economic downturn is wrapping up, the government is entering a transition phase to move Canada along the path of economic recovery, Flaherty said. "We must complete the transition from providing temporary stimulus to generating the conditions necessary for long-term economic prosperity. We must ensure that Canada remains fiscally sound and that we continue to build a future of hope and opportunity for all Canadians," he said. The budget takes advantage of a rebounding economy to offer a wide range of small but strategic goodies. Laying out what he called a "low-tax plan for jobs and growth," Flaherty told the House of Commons the Conservative government's sixth budget will help secure Canada's economic recovery. According to the finance minister, Canada's economy is performing well but the global situation is still fragile and the Conservative budget aims to strike a balance with that in mind. "Fundamentally, we stay the course. We stay on track, we make sure we get back to a balanced budget, to protect our country and Canadians going forward," Flaherty told reporters a few hours before his speech. "We want to be in good shape when the next crisis comes, just as we were in good shape when the last crisis came," he said, referring to the 2008 recession. Flaherty said the targeted spending measures in the budget are fundamental to the government's economic recovery plan, which it calls "the next phase" of its Economic Action Plan. "We have to be targeted in what we do. The Canadian experience with large untargeted social programs has been large bureaucracies, excessive costs, excessive spending and higher taxation," Flaherty said. To help create jobs and stimulate economic activity, the budget offers a new, temporary break on EI premiums for small businesses, an extension of a work-sharing program that was brought in during the recession, support for the manufacturing and processing sector, and an extension of a program to keep older Canadians in the workforce. The budget includes more money for low-income seniors, a return of the ecoEnergy Home Retrofit program and measures to attract doctors and nurses to rural areas, all demanded by the NDP, and money for caregivers looking after disabled family members, a nod to the Liberals. But the measures don't add up to a lot. The budget includes about $2.3 billion of new spending — at one per cent, the lowest increase in years. The spending equals the unexpected growth in revenues and some cost savings, leaving the projected deficit unchanged. Cost savings will come partly by closing some tax loopholes, which Flaherty said will not make the richest Canadians happy, and by launching more strategic reviews of government departments. By 2015-16, Canada will have a surplus of $4.2 billion, according to the government's plan. Some observers called the budget "a dog's breakfast" because of all of the small measures in it. "There seems to be something for everybody," said Scott Clark, a former deputy finance minister in the late 1990s. "If there's an election, this is their platform," he said, adding that he views it as a "purely political budget." As expected, the budget is silent on the Bloc's key demand of $2.2 billion for Quebec to compensate for the HST and the corporate tax cuts scheduled for this year and next stand despite Liberal demands to roll them back to last year's rate. There are no reforms to Canada's pension system, another NDP demand. There are no personal income tax cuts in the budget, but Flaherty says the Conservative government is helping individuals, workers and families through a range of other measures that help Canadians save money, and he said this year's budget directs money to people who need help the most. How satisfied are you with the 2011 federal budget? It includes a top-up for the poorest one-third of seniors receiving the Guaranteed Income Supplement, amounting to $600 a year for singles and $840 for couples. Three years after it was promised in the 2008 campaign, the budget includes a Children's Arts Tax Credit that would allow parents to claim 15 per cent of registration costs for eligible arts and culture programs for children under 16 years old. The tax credit is non-refundable and can only be claimed on expenses up to $500. The government is also promising to introduce a Family Caregiver Tax Credit — a 15 per cent non-refundable tax credit on an amount of $2,000. The measure is aimed at approximately 500,000 Canadians who look after family members who are infirm and it would start in 2012. Giving a nod to rural Canadians, the budget includes a tax credit for volunteer firefighters. Again, it's worth 15 per cent of an amount of $3,000, for firefighters who perform at least 200 hours of service per year. The fine print on this measure, however, says that firefighters who currently get a tax exemption on honoraria for their services must choose between that tax exemption and the tax credit. They can't take advantage of both measures. While there are a number of measures to appeal to rural Canada, cities were not left out of this year's budget. The Gas Tax Fund, which provides $2 billion per year for infrastructure, would be enshrined in law, the budget proposes, to provide greater certainty to cities and provinces that the funding will continue to flow. For older Canadians, eliminating the mandatory retirement age of 65 for federally regulated employees and a $10 million investment over two years for New Horizons for Seniors in support of projects that raise awareness about elder abuse are included in the budget. There are a number of measures aimed at students and on education and training. For example, exam fees would be eligible for the existing tuition tax credit. Debate on the budget is scheduled to begin Wednesday, but any vote on the budget is likely to come after the government faces a number of other possible confidence motions. The Liberals for example, may move a non-confidence motion related to a committee report tabled Monday that recommended the Conservatives be found in contempt of Parliament. Ignatieff said that decision would be made during a Liberal caucus meeting Wednesday morning. Another possible election trigger could come on Friday, however, when a vote must take place on some outstanding money bills. All money bills are automatically confidence votes which means the opposition parties will have a chance then to take down Harper's minority government. Budget 2011: How satisfied are you with what's in it?